It was my turned to post on Romance Books ‘4’ Us blog. 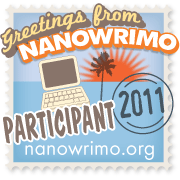 Come leave a comment on my post and learned why I do the Nanowrimo each year. I won the Nanowrimo with my story The Son of the Matrix Crystal Hunters. I plan on publishing it sometime this next year. 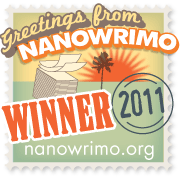 I just validated my Nanowrimo story and I have won the nano contest. I won the Nanowrimo contest! I won the Nanowrimo Contest!!! Here at NaNoWriMo HQ, we are cheering ourselves hoarse in recognition of your epic creative accomplishment this November. One month ago, you committed yourself to this wild write-a-thon: 30 days of high-velocity, no-holds-barred, anything-goes noveling. And now, 50,000 words and one month later, you are a NaNoWriMo Winner! I finished the 50K word count and I won the novel in a month challenge. 1. I rarely prepare for the nano expect to clean my house and buy convenience food for my family, since I won’t be doing much cooking or cleaning once the nano starts (although I will cook the Thanksgiving dinner). 2. Sometimes I start three completely different MSs to see which one will keep my attention for the entire month. This can get a little dicey if I decide to do that one November 1. 3. I never plot out anything. To quote Chris Batty (co-creator and former director of the nanowrimo website), “Plot Happens.” And it truly does. 4. Whether your story is about a vegan werewolf, a mermaid afraid of the ocean, or a blood blind vampire, an engaging story line is key to keeping your interest for the entire month. 5. My total focus is on word count and so should yours be. 6. I tell my interior editor to shut the hell up and mean it. 7. Do not edit. I can’t stress this enough and this is what messes up most writers who enter the nano contest. 8. If it bothers you that much then promise yourself that you’ll edit after the month is over. 10. Do not read over what you wrote to where you left off the day before. 11. It’s okay in the beginning to read over your story when your word count is low. 12. However, when you get up to the middle word count (25 K) reading over all those words will take a great deal of time you can’t afford. 13. My mantra and yours should be: is WORD COUNT, WORD COUNT, WORD COUNT. I just started National Novel Writer’s Month or nanowrimo. Which means I will be taking a break from my normal writing and promos to write a novel in a month.